The UPND has instructed its Members of Parliament to vote against the National Dialogue Amendment Bill when it is taken to Parliament at Committee stage today. 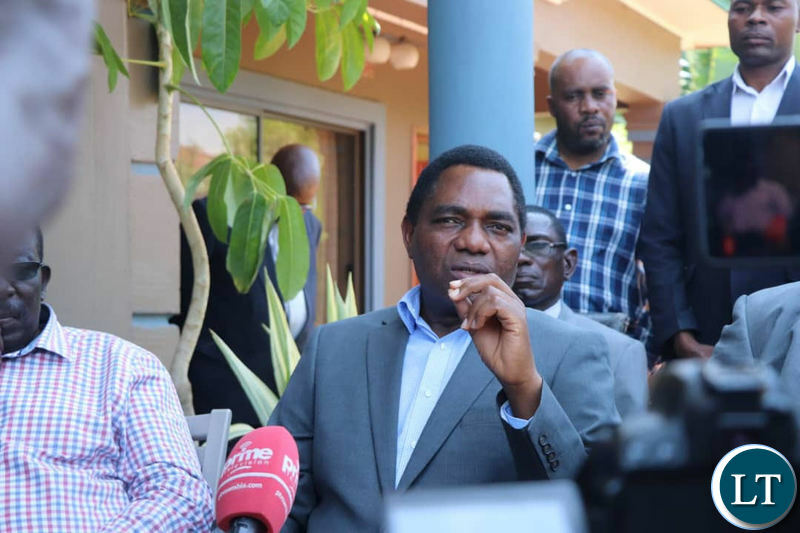 And UPND Leader Hakainde Hichilema said the opposition Alliance position on this proposal by President Edgar Lungu and his PF is that it is fraud and non inclusive and meant to abrogate Zambia’s democracy. Mr. Hichilema said the Alliance is aware that this bill is meant to stifle freedoms such as freedom of association, assembly, expression and speech adsing that the Bill is also meant to illegally give President Edgar Lungu another 7 years as President of Zambia. He said this proposed bill is illegal and as a people that want democracy to continue flourishing, the Alliance will not allow it to go ahead. “In order to stop this illegal action by Mr Edgar Lungu and the PF as they dearly need numbers of members of parliament to pass this law, we have since held meetings with our members of parliament not to support such a bill meant to stifle people’s rights and our country’s democracy”, he added. Mr. Hichilema however said Alliance partners remain committed to an open and church led dialogue which will encompass among other things electoral reforms, public order act, and all fundamental rights. HH, the worst kind of a leader! He opposes everything meant to make progress and when he is left out he cries our the loudest!!! Hh is the enemy of progress. Upnd have never supported anything good or bad. We’re having by elections in Kafue simply Upnd fired the Upnd council chairman for supporting Lungu in his clean up campaign. Who does that? Any normal person will support anything good, but this former Upnd was fired for supporting a good cause. And now we’re worsting money in kafue thanks to the policies of hh. Upnd mps must open their eyes and start thinking and stop been controlled by hh. Go to parliament and vote your mind. Ask yourselves, it is good for the country or not the vote. Knowing Upnd MPs kaya. The problem is that your MPs will sneak out to the bar when voting time comes. The best you can do is to stay in the bar yourself and chase them back into parliament. Otherwise the bill will passed easily. That is what you did on the constitution amendment until the 14 Days clause caught up with you at the Constitution court. Think Mudala Think!!! Uyu yena Twabwelapofye! HH do not oppose everything and anything. You will be caught up with the same old laws if you do not change them now. Allow your sheep(MPs) to debate wisely and also to vote wisely. If you leave only PF in parliament, the bill will go unopposed as they have independent MPs ofn their side. HERE WE GO AGAIN! MOMENTS AFTER THE SO CALLED TCMBS THROW-UP. ONLY TIME WILL TELL. BUT IT WAS ANTICIPATED. OPPOSITION NUMBER 1 MP DOUBLE H HAS SPOKEN TO HIS FLOCK. ALWAYS IN THE NEGATIVE. Should Government fold it’s arm and do nothing, listen to hysterical extremists or move ahead. I can rest assure you, for double h, its about power in 2021. For the TCMBs its about money and favours. For the GRZ it’s about the mandate given to it. I don’t what’s for you but for me it’s about my Country, mother Zambia. HH you always slow down your MP’s grom getting involved in parley debates. And when Bills are raised, you turn around and instruct then to boycott. Really what kind of an opposition leader are you. He a properly qualified lawyer. I don’t know what you do, but if you have faked your qualifications, it doesn’t mean others have done so. Our constitution is based on representative democracy. We choose Mps to deliberate on our behalf and pass bills on our behalf in PARLIAMENT. There is nothing about National Dialogue outside PARLIAMENT. People’s power lies in their chosen MPs . Not the scandalised Bishops, Deacons, pastors, prophets and other dubious charactors coming through the back door under the name CHURCH. There must be something terribly wrong with HH. Since when did dialogue become illegal? does he know the meaning of illegality. Why is he so insistent that the dialogue must be led by the mother church bodies when from among themselves there is disagreement which led to the resignation of a senior cleric because the process has been adulterated. Don’t the many learned comrades in Upnd ever advise the Oval Head on how parliament operates? The Bill will put for debate for and against. So if our MPs from Southern Province walk out they will simply give the PF the chance pass this Bill without challenge . What bitterness is this? No law can be made outside parliament. They are lawless and clueless on the premise of ignorance. The idea of electing MPs on tribal lines than on the desire or need to work for the people. Allegiance ought to lie with the electorate not a selfish individual otherwise, it’s the unnecessary Kafue bye election. How would this dunderhead run a government if he doesn’t even understand the role the legislature plays??? How can you call the process of law making by parliament illegal??? Who really advises this guy?? From the sentiments of the 3 cmbs and now this misguided oval head its very clear that the dialogue was an evil plan aimed at harming the country. Well done ECL and PF for avoiding it and refusing to dialogue with criminals. He is a wasted project. God please help Zambia from HH . Problem with HH is he wants to be calling the shots. Just accept you are just an ordinary person like the next man. By the way when someone referred to the money HH has stuffed in Panama, the person was told that HH as a businessman he was acting just as such. But I ask a question where was this money made? It was made in Zambia and as such Zambia must see the benefits. But then, HH is a friend of mine owners and he’s just acting such. What kind of a human being is hh who doesn’t learn from his past mistakes? He voted against the bill of rights and shortly thereafter, he found himself needing the same. And now this! Awe kwena, you’re full of suprises. How i wish the bill of rights could have gone through, cause my fundamental rights as a citizen were more guaranteed under a law than a mare promise by a politician of this and that. All thanks to HH the pessimist. The correct way to describe people like HH is that he is an imbecile!!!!!! The only thing that is legal and Democratic to HH is voting him in to power. Everything else is illegal and undemocratic. One of the things that needs amended in the current constitution is the public order act which come 2021 the tr!bal t0nga god will be crying about when it catches up with him. Unfortunate voting is a secret in Zambia so no one will know who supported what not even the privatization thief. Does anyone know why Harry Mwanga Nkhumbula never sign the declaration of Independence instead the secretary general of UNIP KK signed and became Zambia’s first president? It was because Nkumbula went drinking the night before with prostitutes and was not in a position to do the signing the following morning. No one opposes a thing without reasons. There a many bills which the PF is proposing to amend including maintaining ministers in their positions during general elections. How will people distinguish govt resources from the minister’s campaign resources if the minister is also a parliamentary candidate? what will prevent the minister from driving a govt m/vehicle in his/her constituency during the campaign period? The PF will not be in power for ever. These same laws, if enacted, can hamper them from reclaiming power in the event that they become an opposition party. Do not enact laws which will benefit you in the interim but work against you in the long run. Be objective. It’s not about reclaiming power but doing the right thing. The dialogue being called for by churches is illegal and non binding. Let parliament enact the law so that future governments will be guided by this law. The same HH can come disown the resolutions that may be made during the church dialogue once he assumed power but not so with what parliament has made. same pf chaps comenting from their secretariat…..what a shame. Need to read this bill before commenting. What is it all about? When we say that HH is a BITTER MAN,his stooges rolling their sleeves up with insults. HH is too bitter no wonder his reasoning is EVER DANGEROUS. The so called church is not doing anything better for this man.HH needs spiritual help not national dialogue as proposed by the so called church mother bodies. Can you imagine if HH lose his 2021 presidential bid with his self-destructive reasoning! Which bitter! HH is telling you the truth. Your president wants to bulldoze everyone. Only what he wants is what he wants the opposition to follow, why does he want to hand pick the people to lead the national dialogue in which he is also a participant.let independent bodies e.g the civil society chose who should represent every participant at the dialogue, . Ba pf, everything ma shoddy , con court handpicking, which democratic country runs like that. always negative,what type of a person or leader is he?It puzzles me to see those former MMD MPs who were in the governmemt have been brainwashed by visonless for this country but for himself relegageted themselve to blindly follow him.Prof Lungwangwa, please advicse your wamuyaya leader! !Laws are made by parliament and mps have the right to vote for or against freely on behalf of thier respective voters,not a party leader!!! Opposing everything even things that seek to improve on the current situation is a sign of fear that your opponent will be credited and your campaign promises get reduced. Should we wait for someone who might never be president for us to move on? Useless opposition leader this chap is becoming, its good the bill passed and waiting the real presidential to assent to it.